Did you know the Capitals, Devils and Sharks all won on Nov. 24, 2010? Ryan did. My son has a remarkable memory. When applied to the subjects that interest him, its power can be breathtaking. His ability to recall the dates and scores of thousands of NHL games is so stunning that it has left us with mixed feelings. Of course I love to see the full abilities of his remarkable mind unleashed. At the same time, these displays serve as confirmation of his differences. And as much as I try to celebrate those differences (and have gotten better at doing so over the years) there remains a part of me that wishes they weren’t there. That’s just being honest. Last night was a good sports night in our household. The three NHL teams we follow, the Devils, Capitals, and Sharks, all won. I mentioned this to Ryan this morning. I couldn’t remember the last time it had happened. So I asked him if he knew. I was stunned, and at the same time, not surprised at all. I’ve seen this before. I asked him to show me. A few clicks of his mouse later, I was staring at the NHL scoreboard from Nov. 24, 2010 (which was actually a Wednesday, Thanksgiving eve). 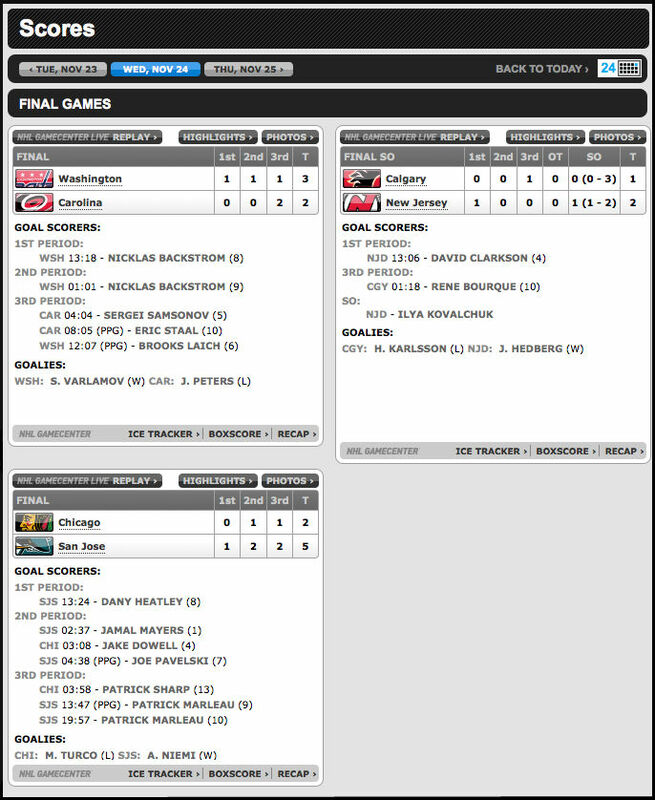 There it was: Washington 3, Carolina 2. New Jersey 2, Calgary 1. San Jose, 5, Chicago 2. I asked if he was sure that was the last time this had occurred. He initially said yes, before hesitating and qualifying his answer. It was the last time he knew of it happening. The exchange gnawed at me as I waited for my commuter train this morning. I suspected Ryan was wrong, that the three teams had won in the same night more recently. Still, I was awed by his ability to recall, within seconds, a date when it had happened. So I started checking, scrolling back through the NHL scores from this season on my phone. Here’s the thing: He was wrong. By a long shot. The Caps, Devils and Sharks have all won on the same night four times this season alone. I didn’t check beyond opening night, but surely if it has happened four times since October, there are many other instances in the two intervening questions. And you know what? I was kind of glad he was wrong. His being wrong means committing entire seasons worth of data to memory is not something he does compulsively. 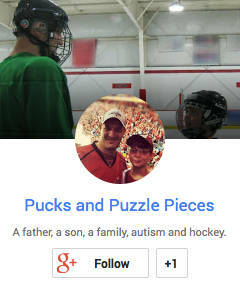 There was a period over the last couple of years that he studied the NHL scores obsessively. It was during that time that he memorized at least two full seasons’ worth of results. But he moved on. He still checks the scores. He can still tell us every team’s record on any given day. But his obsessive score-checking has been turned down a notch. It doesn’t bother him at all that he knows more about two recent seasons than all the others. That knowledge is compartmentalized. OCD may have helped him memorize all that data, but it didn’t compel him to continue doing so beyond the period it interested him to a higher degree. And yet, the things he memorized during that time are etched in his brain, cataloged, indexed, sortable, and instantly recallable. Those two seasons are part of the database that makes up his brain, but they’re just a small part. Ryan is not a human computer. He’s a human. As black and white and linear as his brain is, there’s room for zigs and zags and imperfections and the occasional curve among all the straight lines and right angles. It’s all part of what makes him who he is. He is not easily definable. He may be consistent, but he’s still full of quirks. He colors outside the lines. As well as I think I understand him — and I like to think that’s pretty darn well — I am still learning about him and how his mind works, one instantly recalled, three-and-a-half year old set of scores at a time.